Its been a while since I've posted on here....I've been terrible I know!!! Well, as some of you will know, I moved in April to a new yard in Henley-on-Thames as I was desperately seeking new facilities as I had been training my horses in a flooded arena for over 6 months, and it was becoming somewhat tricky for my Grand Prix hope to actually progress!! We've had a great time here, helping the owner progress her riding skills when she is not travelling the globe, and also training her horses and selling some for her. My boyfriend Nicolas Bordas, an event rider joined me here in late summer after spending a year at William Foxpitts. We are now starting a new challenge in a new yard where we have the room to progress and reach more clients. We are moving just 30mins away to Warfield, to Brookfield Equestrian (which can be googled lol!). Nicolas will be taking on 3 rides on young eventers and we will both continue training our own and clients horses, also having spaces to take liveries of our own for breaking, rehab, comp training, holiday livery and longterm livery. We'll also be training riders at the yard and around the area...so lots to get our teeth into!! So from now on news of Nicolas and his eventers will appear on the website until he has built his own site. Meanwhile, here is a little pic of Nico doing his stuff over the jumps with his own Tchekhov Rouge (now 6yrold) and a pic of my boy at his high profile show, with our first attempt at Advanced!! Thats all for now!! Back to work after the Nationals. Disco Diva did us proud at the Nationals in Warwickshire!! A fab 5th place with 69.44%. We would have of course prefered to be placed higher as her test was foot perfect and her transitions all truly and correctly accented, with lovely uphill paces throughout. I do sometimes feel, as she has such natural collection running through her, it is often mistaken for tension!! We were ealry on in the day also, so I think this often makes a difference to the judging. She worked and felt superb, focussed throughout and did the test of her life, far better than her regional test, which she won with 72%...!! No spooks, no sillies, no naughties.....not bad for only a 6month competition campaign!! There is definately alot more to come from this little pocket rocket of a mare, so I am not too worried for her future. So its back to work with all the others, liveries, clients and my own. Today we took 5yrold Lambada (Bella) out for her first time since acquiring her last year from the Brightwells sales. She has need time to physically and psychologically grow and its paid off. She was a gem, so competitions can now be planned for. I have also picked up 8yr old Fabritzio's (Fry) work, so we'll be aiming for more advanced classes in the not too distant future! 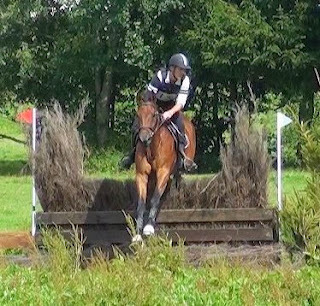 Disco Diva won her regional Championships at Oldencraig EC on 12th August. We were all thrilled if not quite shocked!!! I had a secret hope she could do it, but once we arrived I watched a few tests and saw some very big flashy types.....I thought, "oh dear, today is not our day", but I decided I would not change anything, and warmed up as normal and thought "hey, what have we got to lose..?" To me, the test felt I had done too much work to keep everything active and correct, so thought that it had looked messy!!! But then our result came through late, and low and behold we had topped the open novice with 72.4%, a good 3% clear of second!! My mum (owner of Disco Diva) then later confessed that the test looked good, and didn't say anything as she knows how hyper critical I am, and as I had already stated I was not happy, she knew best to keep schtum!!!! I can be very stubborn at times and single minded - thankfully I have a good team around me who just ignore me!!!! We thouroughly enjoyed the mounted prize giving - more of those please! - and even got our picture in the Horse and Hound!! Well, we had our Open Novice and Elementary regionals with Wilehmina, owned by Carolyn Alston and, Disco Diva owned by Lynne Hawes. Wilehmina, aka Millie performed calmly in the Novice gaining 68%, but was more tense in the Elementary as really it was an edcuation for her, seeing as she has only been in full training for 1 year after having 2 foals. Diva was a gem and again, although not that experienced in Elementary, worked her socks off with less tension than ever before!!! Placed 6th with 66%, I was thrilled as we await her Novice regional in a weeks time! I'm sooo looking forward to it, and along with some extra BD training seesions I hope we achieve all that is possible with her at the mo! !